Born: 1 January 1863, Forfarshire, Scotland. Died: 29 November 1911, Germiston, South Africa. George O. 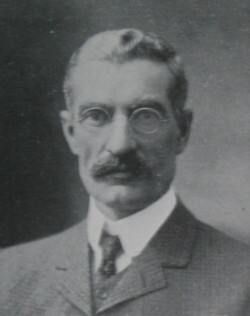 Smart, son of William Smart, was educated in Forfar, Scotland, and became a member of the (British) Institution of Mining and Metallurgy (MIMM) and of the American Institute of Mining Engineers (MAIME). He came to South Africa around 1881 and settled in Natal for some years. In 1889 he came to the Witwatersrand and on 16 May 1891 married Alice M. Shaw of Karkloof, Natal, with whom he had a son and a daughter. After holding various positions he was appointed battery manager at the George Goch Company, a position he held until 1898. In that year he became battery manager at Simmer & Jack Proprietary Mines, Ltd, Germiston, which at that time had the largest battery on the Witwatersrand. During the last few years before his death in 1911 he was reduction works manager at Simmer & Jack. His reputation for skill and judgment in his profession was widely acknowledged. In 1903, after the Anglo-Boer War (1899-1902), Smart became a member of the Chemical, Metallurgical and Mining Society of South Africa, serving on its council from 1907 to 1909 and again for the year 1911/12. He contributed several papers to the society's Journal, including "Some accessory stamp mill appliances" (1906/7, Vol. 7, pp. 133-135), "The effect on amalgamation of different intervals of time between the dressing of plates" (1908/9, Vol. 9, pp. 425-) and "The tube mill circuit and classification" (1909/10, Vol. 10, pp. 282-). Later he was one of the contributors to A textbook of Rand metallurgical practice (London, 1912), by R.S.G. Stokes* et al. Journal of the Chemical, Metallurgical and Mining Society of South Africa, 1904/5, Vol. 5, Members; 1906-1910, Vols 7-10 and 1911/12, Vol. 12, Council, and papers by Smart. National Archives Repository (TAB), Source MHG, Vol. 0, Ref. 19291: death notice, George Osler Smart. Obituary: George Osler Smart. Journal of the Chemical, Metallugical and Mining Society of South Africa, 1911/2, Vol. 12(6), p. 241.